Are you able to intellectually engage in a conversation about a future result that is mutually beneficial and willing to emotionally commit to take action to achieve that result? The eagles might have another word for it. Yet, it’s done in their very own little piece of heaven. 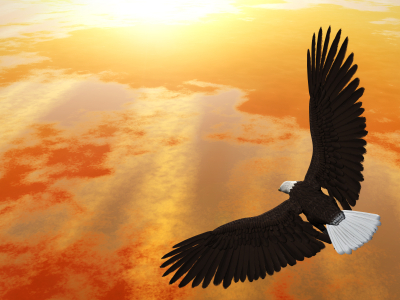 That’s what I want for us – to soar like eagles, as equals. Is that a tough question? Yes, it is. In fact, the inherent magic of this thought exercise is that there are only two possible answers: Yes, or No. Are there tender rewards waiting? Yes, there are. Eagles will lift off to explore the unknown, while Turkeys continue to peck in the dirt. If you just made an aerial circle to test your wings, congratulations. For those confused and timid souls happy with the way things have always been, please, stop reading, now – before you become completely offended by the Rest of the Story. Since you’re right here, at the tip of my wing, you understand this Universal Principle. For us to be flying, together, we purposefully chose to leave the ground – Off the ground, or On the ground. Choice is ours. Within this pattern of absolutes, we are either Growing, or we are Decaying. Comfortable fence-sitting is not an option. You know this – I’m preaching to the choir. And, that opens the vista of where I want to go with a Partner. I believe in the Promises made by the One who created the playground of heaven, for us. Even beyond the Future fulfillment, we can enjoy heaven on earth – right here, right now. A whole new world waits for us — let’s dance!